End of your arm: "Put on Some Lipstick and Look Alive"
This is an absolutely magnificent essay. "In 1996, a few years after the democratization of Czechoslovakia, my grandmother walked into a Jewish Agency in Manhattan to apply for restitution from the German government for her financial losses during WWII." "Halfway through this procedure the interviewer left the office to confer with his superior. 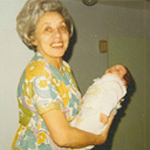 My mother, raised in the ruins of the Holocaust and herself a refugee of the Warsaw Pact Invasion, was drained, emotionally and physically. Slumped in her chair, pale and teary eyed, she watched in wonder as my grandmother made her way to a mirror on the wall to fix her hair, straighten her blouse, reapply makeup."